They often say that people who are good at English have a wide range of vocabulary. Indeed, any person who have good vocabulary will be able to speak his mind using the right words and write to express his ideas using the appropriate terms. Since gaining vocabulary knowledge is very important, people are advised to read a lot. They are often suggested reading newspapers, journals, magazines to improve their vocabulary. Familiarizing and memorizing these vocabulary words are tedious and time consuming. Most of the time, people who need to improve their vocabulary are those who are scheduled to take an English proficiency examination. IELTS or the International English Language Testing System exam and TOEFL or the Test of English as a Foreign Language are two tests where a candidate’s vocabulary power is put to a test. Since studying vocabulary will take time and effort, a vocabulary building software will be very necessary. Hence, Ultimate Vocabulary 2014 is a great help for IELTS and TOEFL candidates. This great software, Ultimate Vocabulary 2014, is specially created to help people pick up their speed in learning vocabulary and make this knowledge strong in only a short span of time. Since vocabulary building is a never-ending process, this software will help learners to achieve the vocabulary skill in just a short span of time. Ultimate Vocabulary 2014 offers its learners a step-by step training and repletion based philosophy. A step-by-step training will introduce learners on how to master vocabulary well through different skill building activities. A repletion based philosophy will make the candidates remember and memorize these words. The tool has a very comprehensive activities and lessons that will surely guide the learner to increasing his or her own vocabulary bank in not time. What is best about Ultimate Vocabulary 2014 is it has exam-tailored words for IELTS and TOEFL. Meaning to say, there is selected and specific vocabulary only used in these exams that this program has. No need to memorize words that are not related with these tests. Learners can focus and have more time studying words for the exam they are taking. Strategic learning and exam specific learning make this program a must have. Learners can learn words and use them for the test in no time. They will be able to understand passages better, speak with better words, and write essays with powerful vocabulary. 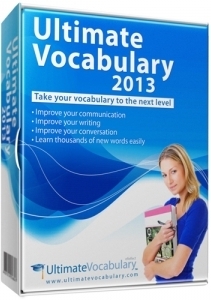 The Ultimate Vocabulary 2014 is the best partner for IELTS and TOEFL vocabulary building.